Pack: Not spirit totem bound, but in a pack with the twins, Bryndis and Eydis, as well as five Fimbul wolves that seem to follow them all around. 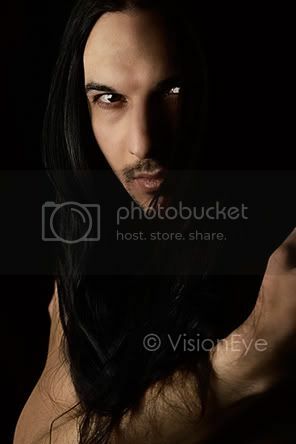 Gabriel is a wiry man, standing at a rough six foot tall with long black tresses that are always immaculately clean and tidy, often pulled back and held in a ponytail with a leather strap. Often he is seen in a large, midnight black leather jacket, lined in a fur of the same color, insulated black leather pants, leather boots, and fingerless leather gloves. Most often, he is also seen with a white leather pouch hanging at his hip, various gaian glyphs upon it, a large sword dominating his back from one shoulder and down his spine, kept within a glyphed sheathe, and a last knife dangling from a sheathe at his neck. Much the same figure, but there's something heavily spiritual within him, as if he is far more spirit than flesh whilst in the umbra. The temperature around him drops, severely to frigidly cold temperatures, and within this aura the drums of war seem to beat within the hearts of others, radiating strength. A mantle of snow white fur seems to protect him from this cold, wrapping him as if apparel rather than his own fur, and coming to a hood seemingly made of a wolfs head with ever perked ears and ice like eyes that stare off deeply. Lean and lithe, Gabriel's form seems a bit thin for a Get, barring the taught, coiled muscle, more fur gathering to his mane and extremities, as if the form is suited for the colder, harsher climates. His eyes take on a more sinister appearance, seeming to recede into the form, peering out with an icy glare. His fur coloring seems mottled, a mixture of white and gray all over, black marks upon his eyes, muzzle, paws and tail. As with his Crinos form, his Lupus is very much leaner, with thick fur covering him and protecting him from the cold. The same sort of coloring as his Crinos form as well, a mixture of white and gray everywhere, with black marks upon his eyes, muzzle, paws, and tail. Is an accomplished Godi for the Tribe, withstanding his rite of passage with a strength unseen. Has strong Spiritual ties with many spirits of the north and close to the Get of Fenris. He is not really a Get, merely masquerading as one to play upon the honor of the Tribe. Is in a peculiar relationship with both, Bryndis and Eydis. The pack of Fimbul Wolves that follow him are a sign of disfavor, keeping an eye upon him for Great Fenris, not his pack as he says.